Keeping track of visitors to your blog is important. While there are many services and tools available for tracking visitors to your site, Google Analytics is often the service of choice. In this article I am going to provide you with a couple of plugins to view Google Analytics within your WordPress blog. The Google Analytics Dashboard Widget allows you to view a simple Google Analytics graph in your WordPress Dashboard. This plugin requires that the Google Analytics code already be added to your site. To get started using this widget, download and install the Google Analytics Dashboard Widget plugin. Once installed, enable the plugin and navigate to the Google Analytic Dashboard settings page. Enter your Analytics email and password and select the site you wish to access data about. You can also specify who is able to see the dashboard widget but only Administrators are allowed by default. After enabling the plugin and making the necessary configuration, the widget will be shown on the WordPress Dashboard. Only a basic chart along with information about the most popular posts are shown. 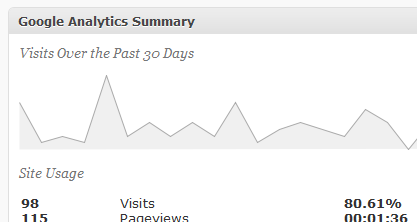 The plugin also adds a column to the Edit Posts page, showing Analytics information for each post. The Google Analyticator WordPress plugin is another way to view basic Google Analytics information within your WordPress blog. 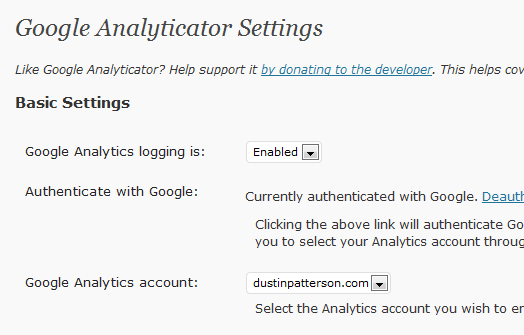 The Analyticator plugin also offers an easy way to add the Google Analytics code to your WordPress site. Start by downloading and installing the Google Analyticator plugin. Navigate to the settings page to configure the plugin. The easiest way to configure the plugin is to log in with your Analytics account. Select the correct Analytics profile once logged in. The settings page contains some other options regarding tracking so be sure to look through those as well if you enable Analytics logging with Google Analyticator. The Google Analyticator plugin also contains a WordPress Dashboard widget for easy viewing of your site stats. Other information shown in the widget includes Top Pages, Top Referrers, and Top Searches. Have any tips for Google Analytics in WordPress? Let us know by commenting below! And make sure to check out our other great guides about WordPress.